Always features real meat as the 1st ingredient. High-quality protein from Deboned Chicken and Chicken Meal, plus L-Carnitine help maintain strong muscles. Contains wholesome whole grains, garden veggies and fruit. Formulated with Glucosamine and Chondroitin to help support joint and hip function, and overall mobility, and essential proteins and carbohydrates to help maintain energy requirements for a healthy lifestyle. A Natural Dog Food enhanced with vitamins and minerals. 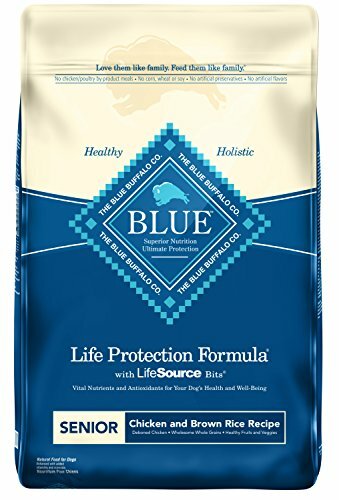 Contains BLUE's exclusive LifeSource Bits - precise blend of antioxidants, vitamins and minerals selected by holistic veterinarians and animal nutritionists that support immune system health, life stage requirements, and healthy oxidative balance. If you have any questions about this product by BLUE Life Protection Dog Food, contact us by completing and submitting the form below. If you are looking for a specif part number, please include it with your message.